This webpage shows installation options for 3000W Triplexer with BPFs in 1411ZU Hammond enclosures. The installation hardware installed on a different sides of the BPF boxes based on an installation option made UHF connectors face a different directions. All Triplexer with BPFs connected measurements on my website are with the first installation option using M-M UHF adapter. 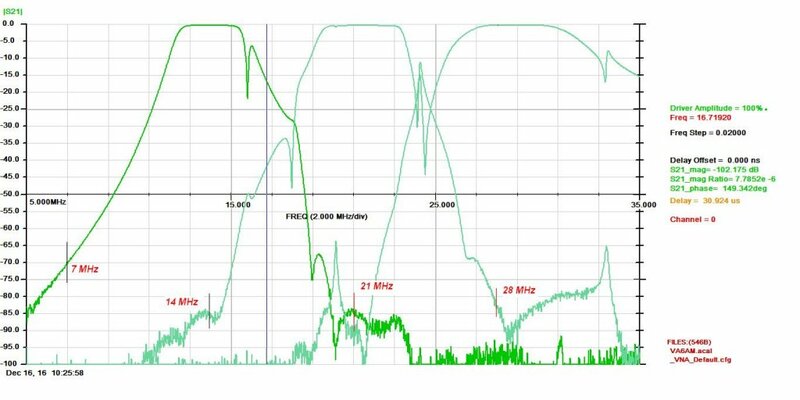 Difference in band isolation with a BPF connection coax cables is by 2-5 dB and not critical for the whole system performance. Please, see W2VJN numbers below. The first way of installation without coax cables provides the best band isolation. Something like on the diagram below, where boxes connected by M-M UHF adapters directly. With 100 CFM 92x92x38mm BPF fans some extra open space required for an easy air flow because of a small distance between fans and a shelf. It can be achieve by making holes in a shelf under each fan, by using a partial shelf board installation or by adding extra board under the triplexer. On a diagram below, all BPFs and Triplexer installed on a wall. It can be installed horizontally on a floor or desk with the same M-M UHF adapters. The second diagram you can see below shows all boxes installed on a wall(or board) connected by coax cables and angle UHF adapters. The coax cables can be as short as 6-7″ (18 cm) including connectors. Flexible coax cables highly recommended. The shorter the coax cable the better. 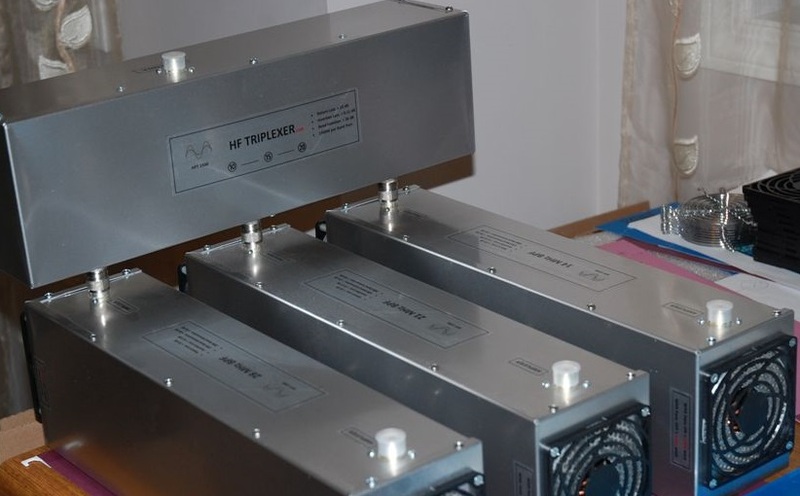 W2VJN, the author of the popular book “Managing Interstation Interference” run some tests for this setup for Triplexer with BPFs connected by 14″ coax cables and angle M-F UHF adapters as it shown on the diagram. He ordered it to use in St.Croix as NP2N in M2 category. Please, read their ARRL DX CW 2017 story and result. Please, see W2VJN measurement’s graph for this installation and table below. All done using VNA 2180 calibrated with connecting RG213 cables using between Triplexer and BPFs . I would like to point out a very low Insertion Loss for every bands. All numbers in the table are for CW part of the each band. The diagram below is for 1444 series boxes 1500W Triplexer with BPFs set . The depth of that type of enclosure is 7″ and the “tower” is quite stable without any extra supporting hardware. The boxes order is to have all connection cables as short as possible, especially for 10 and 15M bands. Right angle UHF adapters shown above can be recommended for this installation as well (to avoid bending coax cables) . Diagram below is Hammond 1444 series boxes installed on a wall Using M-M UHF adapters (without coax cables) . It can be done if BPF connectors installed on a short side of the enclosures. It is a nice idea to use a radio band decoder, like this one from RemoteQTH.com or any other with a relay output, to turn ON a required High Power BPF cooling fan when a particular band chosen. This approach will decrease a fan noise and will allow all cooling fans last longer. With SO2R setup only two BPF’s cooling fans will be running simultaneously.